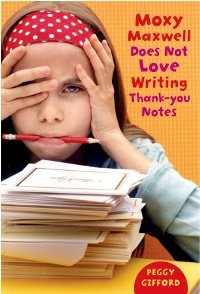 I would love to go on and on about the finer points of the second Moxy Maxwell book, Peggy Gifford’s Moxy Maxwell Does Not Love Writing Thank-you Notes, but I can’t. Even though I found the book to be very funny, fresh and surprisingly dark (more on that in a moment), I just can’t shake this feeling of dread. My feeling of dread does not come from anything found in the above synopsis. No, it comes from the fact that my two little kids combined equal the destructive power that is contained within Moxy Maxwell. My four year old girl is wonderful and precocious and my two year old boy is happy and very physical and together they will probably find some way to sink our house into a bottomless pit or make a beautiful collage for some Father’s Day by cutting out a single picture from every one of my many comics and graphic novels cluttering our soon to be sunk-in-a-bottomless-pit house. One of the reasons I have enjoyed this Moxy Maxwell, and the first Moxy book, Moxy Maxwell Does Not Love Stuart Little is that in it there is a nice balance of impending doom and real life family dynamics. In Thank You there is the familiar destruction of family property that you can see coming from a mile away - and there is some wonderful frustrations that accompanies this knowledge – but there is also a darker, more troubling doom coming. This doom, unfortunately, involves the family dynamics in a way that readers will also see coming. 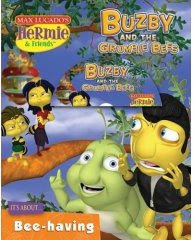 It involves Moxy and her twin brother Mark’s absent biological father and another terribly timed let down. I was surprised that this book went in the direction it did. Here I thought the Moxy series would continue on as just a nice thing for Junie B. Jones fans to move on to when they got older. I thought that the books would just be about the wacky adventures of a young girl and the family that tries to contain her – but this is not so. Amongst all the fun there are real issues being dealt with in real ways – it is like the comic series Amelia Rules in this way. Where I to read this to my own grade three class I know that it would hit close to home for some of them – which can be a very good thing. But, I didn’t read it to my grade three class. I handed my copy off to the grade four teacher (who teaches the grade threes I had last year). I read the first Moxy to last year’s grade three class in September and some of the turns-of-phrases used went over their heads, but when I read it again in June they loved it. So I think this book is perfect for late grade three and up. I truly hope that there are more Moxy Maxwell books coming, and if you or the young readers in your life have a book store gift card burning a hole in you pockets this holiday season, this is the perfect reading material to fill in the last week of the school holiday. By the way, I didn’t fit it into the review, but I wanted to mention the fun photos by Valorie Fisher that are spread throughout the book. They are meant to be by Moxy’s twin brother and they tend to punctuate the events that are then happening. I am a grade 3 teacher and I was at a Professional Development session on Guided Reading this afternoon and the teacher giving the session was one of my supervising teachers when I took my teaching degree twelve years ago (my, how time flies!). I respect this teacher a great deal, so when she started pulling out story books that we could use for specific comprehension activities I paid close attention. Then she took out one of the ugliest books I have ever seen. It had an interesting illustration in the middle of a couple of boys and a grown man on the back of a woman (obviously the males on the back of the mother), but the when coupled with the awful looking border, I was turned off on the book right away. Yea, I was judging the book by the cover – it was so ugly, I had no choice. I wouldn’t have even read it on my own, but this teacher was bound and determined to read it to all of us. She loved this book for a lot of reasons. She loved all of the lesson ideas a teacher could get out of it. She loved how it could be used for a grade 4 and 5 art lesson (famous paintings morph as the story progresses). She loved how even though there are amazing changes happening within story, no explanation is given, which makes the questions the kids can ask and answer richer. She really loved the vocabulary the book offered. She really loved a lot of stuff about the book. I even hated the back cover. Then she read the book. She was almost giddy that she had the opportunity to share this ugly looking book. I was not impressed. Then she read the book. 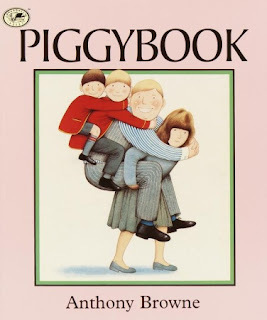 Piggybook turned out to be one of the most stunning and troubling kids books I have ever had the fortune of reading. Basically the book is about a husband and two young boys that treat their wife/mother like the hired help. Like hired help that can’t ever quit…but then she quits. Left for themselves, the other three slowly morph into the pigs that they are. The house changes, the language in the narration changes. That’s the clever stuff. Anthony Browne does a really nice job of writing and illustrating these changes. The troubling part is in how none of this really seems to be played for laughs. There are four panel scenes early on showing the mother at work – never with her family – always at work. The boys are in full colour, but the mother is always in this sepia yellow – and alone. And you never really see the features on her face. She is a non-entity – she is unimportant in her own life. She has no ears or mouth and her eyes are only slits. This is a woman beaten down. Then she leaves. The guys fall apart. She comes back – they are pigs and with her rights asserted she is the beautiful young mother she always was supposed to be. This is a book rich with possibilities. I imagine that it might spark some hard conversations about inequalities and divorce. Some of the teachers made jokes about their husbands being like the man but that sort of thing should not be acceptable when using this book. I don’t have a copy of Piggybook in front of me, so I may have gotten a couple of details wrong. Also, I always review brand new books on this blog, but this one came out in 1990, so you may have a copy in your school or library already, but if not, Random House has it for sale HERE. Tomorrow night my wife and I plan on attending the new Canadian movie, Passchendaele. If you are Canadian and you aren’t sure if the movie is going to be set in World War I or WWII, the rule of thumb is that if you have heard the name of the battle, and that battle isn’t Dieppe, then it was in WWI. That really annoys me. I may not have encyclopedic knowledge of Canada’s military heritage, but the majority of us Canadians have little or no understanding of what our countrymen (and women) have endured on the world’s battlefields and at home. We were feared. We were loved. In the past few years (10?) there has been a push to get people out to Remembrance Day celebrations, but I still don’t find that knowledge of specific events has gone up. 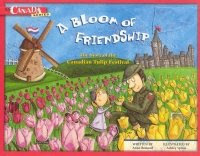 A Bloom of Friendship: The Story of the Canadian Tulip Festival by Anne Renaud and Ashley Spires does a nice job of filling a little part of this void for teachers and the young readers they...teach. Basically, Bloom tells this story that I got from Wikipedia: In 1945, the Dutch royal family sent 100,000 tulip bulbs to Ottawa in gratitude for Canadians having sheltered Princess Juliana and her daughters for the preceding three years during the Nazi occupation of the Netherlands, in the Second World War. The most noteworthy event during their time in Canada was the birth in 1943 of Princess Margriet to Princess Juliana at the Ottawa Civic Hospital. The maternity ward was declared to be officially a temporary part of the Netherlands, so that the birth could formally be claimed to have occurred on Dutch territory. In 1946, Juliana sent another 20,500 bulbs requesting that a display be created for the hospital, and promised to send 10,000 more bulbs each year. In telling this story the book tells a big part of the story of WWII and Canada’s part in it. When I fist saw the cover of Bloom, I was hoping it would be a storybook that I could use with early elementary kids, but instead I got so much more. Primary Documents! I didn’t know what a primary document was until University, but this book is full of them. Newspaper clippings and photos are interspersed with chunks of text and “Instant History Facts” to tell the story of the Dutch royal family, Canada’s battle experience in Holland and the whole war in general. I am very impressed with this book, and I am going to ask my principal to order multiple copies for next year’s Rembrance Day studies (and if I get them this year we will use it whenever). I will be using the book with my grade 3 class over the next few weeks and I would highly recommend it for upper elementary and middle school students. Even though the cover and format will likely come across as too kid-ish for the middle schoolers it can still be a good teacher resource. As much as I like the internal pictures by Spires, I wish a different cover image was used. I wonder if older elementary and early middle school students will be receptive to a book that, at first glance, looks like a primary storybook. A Review of Wilbur and the Moose, and an Accidental Review of Bubba the Cowboy Prince - Or - Get Ready for All Kinds of Cowboy Awesomeness! I teach third grade. I have a new batch of students this year and I have to decide something. When will I treat them to the greatest story reading of all time? I think most teachers have something they secretly think they are amazing at. Maybe one thinks that no one teaches sentence structure like them, or that they teach Trigonometric Functions like a rock star. I’ve got a couple of things I do pretty well (keeping my desk clean is one of them….lying on the internet, apparently, is another), and reading Bubba the Cowboy Prince is another. I put on my black cowboy hat, my dark green bandana and my silver bolo tie; then I pull out the awful cowboy accent (including a truly horrendous John Wayne impression I use for the Fairy God Cow) – it’s awesome. But, this is not a review for Bubba the Cowboy Prince…well I guess it sort of is, isn’t it? 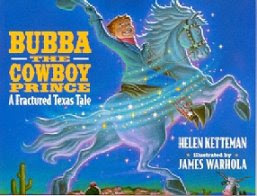 Bubba the Cowboy Prince, by Helen Ketteman and James Warhola is an amazing book to read out loud, with crazy cowboy slang and plenty of silly details in the art to keep the kids giggling every time you or they read it. The dilemma I am facing is that I have all the gear: hat, tie, bandana, Roy Rogers six-shooters even…but only one cowboy themed book to read. I’ve tried. There have been some very valiant efforts by some very big names in the children’s book universe, but none have met my exacting standards…basically, if a John Wayne or Walter Brennan impression doesn’t fit in while reading it, then no go. The question is, will the newest printing of the 1989 book, The Ballad of Wilbur and the Moose by John Stadler make it or not? Well, does the song Big Bad John mean anything to you? If not, listen here and come back. You’re reading this on a screen, It’s not going anywhere. Okay, so basically if you add a chorus of “Big Blue Moose” to every page you have a cowboy kid’s book at least on par with Bubba. I think the reading calls for something a little subtler than John Wayne; more Tennessee Ernie Ford – just channel your inner cowboy-poet and you will be fine. The Ballad of Wilbur and the Moose is a cowboy story-song about Wilbur Little and his Big Blue Moose. They have cowboy adventures involving boxing matches, trains, deserts, a bad guy with one of those little mustaches perfect for twirling, a crooked card game and a gang of pig-rustlers. Oh, and lots of lime juice. It will be like Rio Bravo meets The Good The Bad and The Ugly meets, I don’t know, Yo! Gabba Gabba – and that adds up to all kinds of cowboy awesomeness. 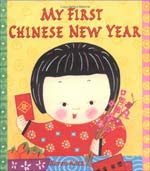 I have no idea why, but my-oh-my does my not-yet-four-year-old girl like reading story books about Chinese New Years. 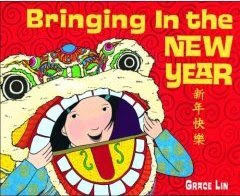 It is bed time for her; I just read Bringing in the New Year by Grace Lin, My First Chinese New Year by Karen Katzby twice each, and she is in her room right now reading the two of them again. She loves books, but there is something that is drawing her to these books lately. The sense of family is strong throughout both of these beautifully illustrated and lavishly colored picture books, which seems to appeal to my daughter. Both are jammed packed with illustrations, with Bringing in getting the edge. Both are informative, with My First getting the edge. Also, and just as importantly, they are both fairly quick reads (something that is very important for evening readings). These are both terrific and informative picture books, and I don’t really think you could go wrong choosing one over the other. They would be perfect for introducing Chinese New Years to an elementary class, and they would be nice additions to any home’s library. This year my grade three class turned about a fifth of our classroom into a class-garden. We had tomatoes and green and jalapeno peppers, basil and cilantro, cosmos and five-foot + sunflowers, very tiny carrots and corn from Orville Redenbacher corn kernels (which made tiny, but real ears of corn). We didn’t start until after the Christmas break, and curriculum responsibilities and an unusual number of snowstorms meant that we were not able to transplant the small plants in a timely manner, but we ended up with a pretty impressive spread. The grade one teacher at my school from this past year is transferring to a grade three class at another school. We were talking back and forth about 3rd grade stuff and the idea of having competing class gardens came up. 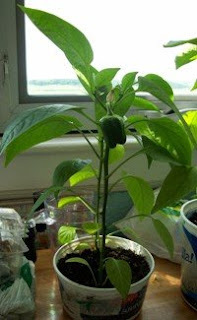 The idea, I think, will be to grow enough peppers, tomatoes, and maybe even onions/garlic to make a pot of class grown – homemade spaghetti sauce. We are going to win, by the way. This teacher was in charge of our school’s recycling program and that job is passing to me this coming year, so I’m thinking of including a mulch challenge to our competition. We’ll make our own fertilizer and grow some awesome plants. Worms and rotting produce = a well rounded education. We are going to wipe the floor, in a very friendly way, with that other class. I mention all this for a couple reasons. Firstly: Any longtime readers will know that it takes me a log of meandering to actually get to a review. I sort of take my time portaging my way around my stream of thought before finishing off with something resembling a review. 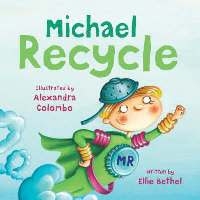 Secondly: Michael Recycle, by Ellie Bethel and Alexandra Colombo inspired the concept of our little two-school competition….that we are going to win. The title character doesn’t really do a whole lot in the story, which is actually kind of nice, and because of this it gets a higher recommendation than it would if the hero fixed all the problems, or if the hero “held the hands” of the townsfolk while they made the changes. Michael provides the inspiration by telling the town that they need to change, and the town does the rest. This is what is happening now. We are being told to change by reliable sources and then it is up to us to listen and change. The common sense lesson that I take away is that we can’t expect anyone to be the hero besides us. We can make a difference. I like it. Michael Recycle was actually out in time for this past Earth Day, but I never got around to it until now….I mean I left it until now so that you interested teachers could pick up this book over the summer and make a plan to implement the concepts and ideas into your own class and/or school. Recycle cans and paper? Of course. Reuse old junk? What teacher/school doesn’t find uses for everything until it falls apart? But we can maybe do more. Grow food? Great idea, especially if you have windows in the right spot, or the right climate for a school garden. Save rainwater to water plants? What a great idea! It wouldn’t take much, and snow, for us, would be even easier to collect. A general change in attitudes? It’s worth a try. I thought it was clever of the book to include GREEN ideas after the conclusion of the story. Some are pretty obvious, but there are some that are pretty obvious and often ignored: like turning off the faucet while brushing your teeth, or turning off the computer when you are not using it (are the computers shut off in your school when everyone goes home?). I like this book, and it is going to be one of the first ones I read to my class this September. Collecting rain water at school. Brilliant! Nit-Pickin’ -or- My Wife Is Not Allowed to Read This Book. My wife is not allowed to read this book. When he gets married, the responsible, yet tricky husband will grab up all the jobs that need doing – but that he doesn’t really mind doing. The big chores I snapped up were: dishes, laundry and cooking; leaving my wife the various floor jobs and a few other things that I am horrible at. It has worked out for us pretty well over the years. Unintentionally this time, I did the same thing when our kids were born. I am now the main ‘accident’ and throw-up cleaner. But my wife is in charge of all hair related duties. My wife is not allowed to look at this book. Well, maybe not NEVER ever, but certainly not until after. After what? After she has to pick and wash and pick and wash all the nits out of our little girl’s hair. 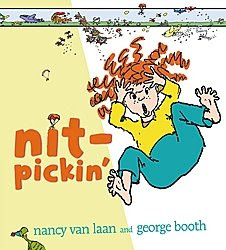 See, change its colour from red to blonde and the girl in Nancy Van Laan and George Booth’s, Nit-Pickin’ looks pretty much the same as my own daughter. Curlier than curly hair with easy to tangle ringlets. This would be like a horror book for my wife. She truly dreads that first batch of lice that our kids will inevitably get at some point in their school careers. I am bringing this book to work and I will bring it home after. I had a lot of fun reading Nit out loud to my students. The text is written as a poem or a song and its beat made for a good reading experience. The art is kinetic and funny, but I almost missed the best part. All along the top border we see what is happening at nit-level as they are picked out, smeared out, and washed out. This leads to a funny and slightly…troubling final page. Teachers and parents, you will want to have this one on hand during the inevitable school nit season. It may actually take away some of the fear of lice kids and parents/teachers have. This is not a comic. Comics don’t belong on this site, so that must mean that this book, The Clouds Above is not a comic book. Comic books belong on my other site…This is not a comic book. It has one illustration per page, meaning there are no panels, meaning this is not a comic. 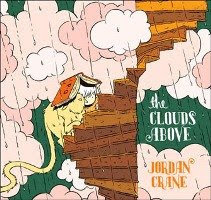 …..Except, that in the Clouds Above, by Jordan Crane, the words that tell the story are encased by white bubbles that point at the speakers….Wait a minute! Those are word balloons! This is a comic book. There is no text along the bottom or top of the beautifully, Maurice Sendak-like illustrations, only word balloons. Tricked!! This is a comic. Bear with me reader(s ??? is there anyone out there? ), I’ve had this wonderful little hardcover on my shelf for well over a year, and every month or so I flip through it or maybe read it again, all the while wondering if I am ever going to find a hook that would allow me to write this piece. I knew when I started this kid’s book review site that I was one step closer to being able to do something with this book. Clouds is an edgy little (its dimensions, not its page count. It is actually 208 pages long) book featuring Simon and his boy-sized pet cat, Jack. Think: Calvin and Hobbes meets Where the Wild Things Are. This is a surreal book with images and conversations that will intrigue and engage readers young and old; reluctant or eager. How can you pass up a kid’s book that contains the lines: “Do we still exist?” “I’m starting to wonder.” I want that on a t-shirt! 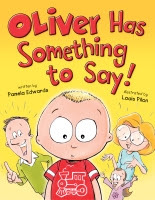 I just bought a copy for my grade three class, and I will pass on what the reaction to it is. It has been available in hard cover for a while ($18.95), and it is available now in soft cover ($16.99). Oh, and it’s a comic. “Jack likes the Ducks,” she says. That is the sole contribution by the other senior staff member of this blog. I’m not sure if the Mom is pulling her weight on this one, but she speaks the truth. With that in mind, when a book comes along called, What’s Up, Duck? I have to show it to the junior member of the staff to see if it passes muster. 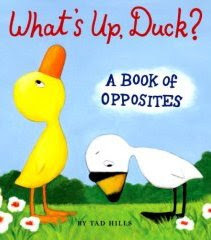 Really though, Tad Hills’ follow-up to his bestselling Duck and Goose and Duck, Duck, Goose (neither of which I have read though) is brilliant. The previous two are storybooks, while this newest is a board book for very young children, which I think is a very good move for publishers. I know my daughter loved the David Shannon David board books, which paved the way for her to fall in love with the regular series. Hills’ art style is perfect for young readers. The vibrant colors and adorable birds should make this a favorite for anyone that comes across it. What’s up Duck? 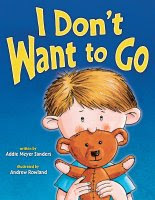 is a book of opposites (with a near-far page that should make fellow Grover fans smile) and while I know there are plenty of those around, this one set itself apart by sheer adorableness. Duck reminds me a bit of the graphic novel series, Owly by Andy Runton. 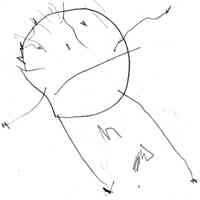 Hills, like Runton, has a strong ability to convey the emotion of his characters through a few simple lines. It is a skill not every illustrator has, but it seems so simple to Hills and Runton, which is important since there is no dialogue in Owly and no words to help with emotions in Duck. I see from Hills’ page at Random House.com that he has another board book coming out in August. I say give this newest one a try if you have appropriate aged kids in your life, and you may just find that you want to pre-order the next one. The Girl In the Castle Inside the Museum is one of the most beautifully illustrated children’s books I have seen in an awfully long time. I usually don’t cut to the chase like this, but sometimes I don’t need to get cute with a book. In this instance I will put the goofiness aside and say that in a million years I would not be able to tell you how artist Nicoletta Ceccoli created these amazing pictures. They look like photographs of porcelain dolls (really pretty ones, not the really creepy ones) specially manufactured just for this one book. I could also say that Ceccoli found a portal to another world inhabited by beautiful, living porcelain dolls, but that would be too comic-booky for my kid’s book blog and it would let in too much goofiness, and I said there would be no goofiness. Ceccoli has illustrated a magnificent world with a magical castle filled with living toys and one lonely girl. Magnificent. So I like the pictures. So what? 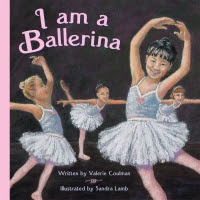 Any elementary teacher that has been around for a while knows that you can get really well written books with sub-par pictures and beautifully illustrated books written with grinding dullness. No fancy pictures can make up for a boring story. 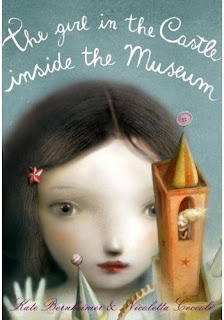 So, has The Girl In the Castle Inside the Museum writer Kate Bernheimer created a tale worthy of its pictures or not? Sort of, yes. It is hard to compete with the pictures, but I like the story a lot, and so does my little girl. It is nearly as haunting as its pictures. It is an imaginative new fairy tale that uses a couple of clever tricks to engage its young readers (for instance, here is the picture my three year old daughter drew of herself to put in the frame in the book. It was a nice touch that she enjoyed). The whole thing is a little disturbing in an Alice in Wonderland, Wizard of Oz sort of way. I think when I share this with my grade three class that will actually be one of the main draws. Kids like a bit of edge, a bit of darkness every now and then in their literature and movies. It helps them make sense of the world around them and they will be able to relate to the loneliness of the girl. Wild, creepy, good stuff. It looks like a book only girls would like, and they may be the target audience, but this thing is so odd that I think boys would be drawn in as well. A sure hit with girls, and maybe a bit more of a hard-sell with the guys.